This book addresses the religious scope of Cormac McCarthy's fiction, one of the most controversial issues in studies of his work. Current criticism is divided between those who find a theological dimension in his works, and those who reject such an approach on the grounds that the nihilist discourse characteristic of his narrative is incompatible with any religious message. McCarthy's tendencies toward religious themes have become increasingly more acute, revealing that McCarthy has adopted the biblical language and rhetoric to compose an "apocryphal" narrative of the American Southwest while exploring the human innate tendency to evil in the line of Herman Melville and William Faulkner, both literary progenitors of the writer. Broncano argues that this apocryphal narrative is written against the background of the Bible, a peculiar Pentateuch in which Blood Meridian functions as the Book of Genesis, the Border Trilogy functions as the Gospels, and No Country for Old Men as the Book of Revelation, while The Road is the post-apocalyptic sequel. 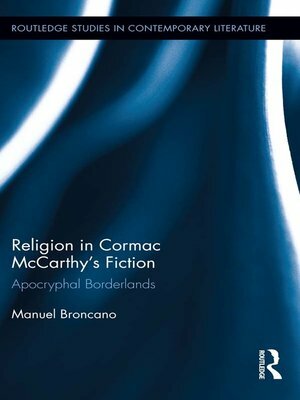 This book analyzes the novels included in what Broncano defines as the South-Western cycle (from Blood Meridian to The Road) in search of the religious foundations that support the narrative architecture of the texts.